Why does Bartoli's beauty matter? Home > Social Issues > Baby, You Are Not HOT Enough! Baby, You Are Not HOT Enough! Inverdale was later forced to apologize. But tweets online poured on and on criticizing her looks, her breasts, her face and her body. There were tweets calling her a man winning the women’s title. It is disturbing to notice that just because she does not fit into the conventional mode of what they think is “Hot,” this athlete is hounded by sexist remarks. Just because she is a woman, her looks matter far beyond her stunning win. In a civil society her win should have been discussed more and with more applause. She has not won any major title before this. 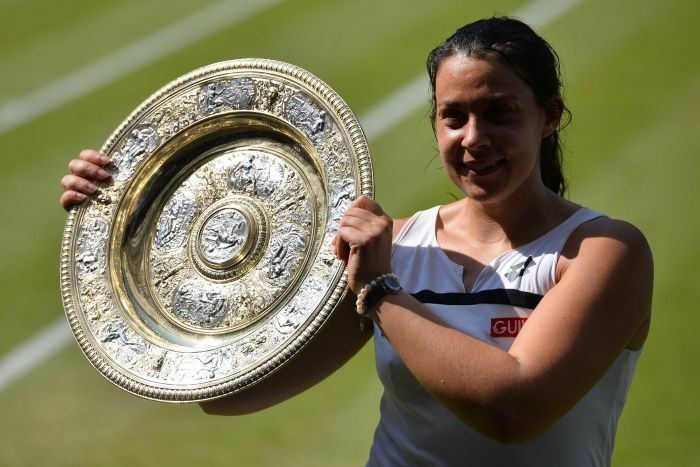 But everyone was outraged because winning the Wimbledon needed a certain type of body curves and a certain kind of face which of course Bartoli did not posses. And here we are not even talking about someone who is in the show business. For God’s sake she is an athlete, sweating in the heat is her daily ordeal. She won her dream, but does that matter, she who is but a woman? She needs a better body and looks as per the critics. Kudos girl! Dreams are anyday more important than the curves of the body. Go girl go! Wimbledon is still a far cry. Let’s talk about home. When Aishwarya Rai gave birth to her baby, the whole nation went insane about the fat in her body. Whom are we kidding? How many women on earth start looking like a ramp model after child-birth? Don’t most of them gain weight? Doesn’t our body too go through the normal wear and tear process? Every one cannot be like Victoria Beckham who gives birth to a child and looks perfect the next day. But are we sure that her perfectness is natural? Why can as a society not accept changed and different bodies? We all know perfectly that no one is alike, but let someone like Aishwarya Rai get fat, everyone gets into a frenzy. The photographs are pasted all over the newspapers and magazines. Who can forget her visit to Cannes that year? We all remember the way the media tore her apart specially for her weight. But wait a minute, do we remember anything about why she was there and what she did? What hurts us about a woman who weight more or someone who does not fit into our conventional sense of beauty? Does it hurt us that Bartoli has worked her way to win the Wimbledon? Does it hurt society so that to pull down a successful and rich woman like Aishwarya, her gaining weight is the best way to target her fall? And who are the judges and authority on beauty? No doubt we are so conditioned about beauty which has to somewhat look like Barbie doll, that society refuses anything else. The obsession with becoming thin is something I have personally seen with friends. And our national obsession of being fair. Why can’t we accept that most of us as Indians have brown skin? Fair and Lovely still sells on this national obsession. As I watch Bartoli’s winning moments now on the re-runs I wonder what has this 28 year old done to be greeted by anything but applause. But she is a woman; her gender came before her stunning win. I hope many more Bartolis win Wimbledon until one day every Bartoli is talked about loud and clear for winning her dream and not for the curves of her body. It was rather shocking to read such cheap comments about Bartoli. Honestly, such losers need to get a life. What I find more disturbing though is the way we women target other women with snide remarks. And like you said, some women go berserk trying to fit into new stereotypes created by demand-hungry conglomerates. They have passed this onto the coming generation too. 🙁 I have heard four and five year olds talking about being ‘thin and beautiful’! It totally kills me. Frankly,Speaking about this topic is a never ending story as there are many such stories every day in every celeb/athletes,etc… infact in every achievement such comments takes place…..well emoted and thought provoking Paromita….!!!! They feel that we (women) are bounded to be either as a sexual machines or entertainers…..Specifically when it comes to sports department most of them would speak about the physical appearances of the athletes but not about the sport they are playing…One of them include Women’s cricket…Does any of them watch it??? Atleast how many of them know that even it exists and encourages their talent ??? Same goes with Hockey,basketball and so on…. Sometimes i wonder how does our generations were said to be as modern/21st century society while thoughts are still unchanged and inequality/safety are at check with respect to gender till date…..In fact if we go back to history they are still far better and matured in respecting eachother than our current human generations…THis cant be achieved overnight.. hope a day would come when achiever’s(Specific to Women gender) are respected by their talent but not by their look factors!! Keep sharing your thoughts and writeups….!!! Its too sad that even a Wimbledon champ is not good enough for some people. Hats off to this young woman who made every body sit up and take notice of her. Good for her! There is a message in her win too, for her detractors. That you don’t have to be good looking to win Wimbledon!! Congrats to you, girl!! Neelakshi, it is unfair to say “you don’t have to be good looking to win Wimbledon”. It resonates Inverdale’s opinion. It is a masked way of saying “you are not good looking”. I am sure you didn’t mean it. But this is how stereotypes have penetrated our subconscious and language. We don’t want any look to be good or bad. Any classification is limiting in itself. What we want is an individual being appreciated and loved for what they are, irrespective of gender, class, body type, colour, and so on. Period. One more interesting fact about Marion Bartoli is that she is considered to be a genius which by definition is anybody with an IQ of over 140. Bartoli’s IQ is 175 which is way ahead of Albert Einstein! And I am also sure there are a lot of men who find her ‘hot’, and that includes me :-). The bigger problem is ‘commodity’fication of women in general -and that is not just limited to tennis and sports, but includes all domains. Society pays attention to a woman’s appearance rather than her achievements. That is a form of discrimination women have to deal from probably their birth itself. Women have been so taken in by this discrimination that they tend to associate their self-worth with their looks. Will the situation improve in the future? Right now it doesn’t seem to be going in the right direction. I find that even men are being increasingly judged by how they look -and men have started paying undue attention to their appearance. While maintaining a pleasing personality is an important thing from the point of have a positive self image, excessive importance could be very harmful for individuals as well as the society. Completely agree with you, Mohan. In fact, the craze for the so-called perfect body is affecting men and boys too. The alarming increase in cosmetic surgeries is the proof of this craze. What’s wrong with looks? IQ is largely genetically determined, so are looks and physique. And Mr. Mohan, the society treats men as success objects whose worth is determined by the value he provides the society and not by his personality and virtues. Hi Raj, I am against all forms of discrimination. And I agree with what you have pointed out that affects boys and men. However, remember that men have taken upon themselves as breadwinners in the what is referred to as the traditional setup of marriage and family. It may not be so obvious in urban setting, but in rural side, where majority of Indians live, that’s the way it is. Boys are certainly under far more pressure to succeed than girls. And it is not healthy to associate one’s self-worth too much on any external parameters -be it money, education, or whatever. And I have referred to the unfortunate trend where even men are increasingly being judged by their appearance which only adds one more dimension to their existing pressure to succeed.